On 15 January 2018, the State Party submitted a state of conservation report for the six Syrian World Heritage properties, which is available at http://whc.unesco.org/en/list/22/documents. The report submitted by the State Party indicates that no damage was recorded this year and no new information was provided. The webpage of the Directorate General of Antiquities and Museums (DGAM) indicates that four looters died while conducting illegal excavations at the Palace of Saint Sergios located at the East of the Basilica of the martyrs Sergios, Bacchos and Leontios, due to the collapse of stones inside the Palace. Reliable scientific sources informed UNESCO that restoration works have been carried out at the western wall of al-Omari Mosque and on the eastern façade of the Koranic school annexed to al-Mabrak Mosque, where basalt stones impacted by shelling have been replaced by similar ones. They also indicated that at the end of 2016, the Bosra Department of Antiquities rehabilitated the storage rooms of the French archaeological mission located within the South Tower of the Theatre, by sorting out and protecting the contents of 400 vandalized crates of archeological material. See General decision 42 COM 36 of this Document on the World Heritage properties of the Syrian Arab Republic. The lack of access to the property does not allow a full understanding of the damage incurred, nor an assessment of the restoration works carried out. It is recommended that the Committee express its concern about the situation at the property and the threats that it faces from the armed conflict, and acknowledge the efforts of the local communities to monitor and protect the property despite very difficult circumstances. It is recommended that the invited joint World Heritage Centre/ICOMOS/ICCROM Reactive Monitoring mission to the property be carried out to examine the state of conservation of the property, as soon as the situation allows. The armed conflict in Syria started in March 2011 and has constantly escalated leading to significant violence and degradation of humanitarian conditions. It continues to inflict damage on the inscribed properties as well as on the 12 sites inscribed on the Tentative List. Sites continue to be damaged by shelling, fires, extensive illegal excavations, military use, construction violations, in addition to intentional destructions and inappropriate use of archaeological sites by internally displaced populations. On 15 January 2017, the State Party submitted a state of conservation report, available at http://whc.unesco.org/en/sessions/42COM/documents/#state_of_conservation_reports, with detailed information on the destruction and damage at the six World Heritage properties. This report represents an official statement from the Syrian authorities and collates available information from the branches of the Directorate General of Antiquities and Museums (DGAM) and from the local communities up to 31 December 2017. The State Party notes that as ground access in Syria for heritage experts is limited, the full extent of the damage to World Heritage properties cannot be assessed in detail. In particular, the report does not provide first-hand information on the Ancient Villages of Northern Syria and the Ancient City of Bosra that are exposed to the armed conflict, and thus does not allow a full understanding of the extent of damage at these properties. The State Party reported on the actions carried out by the DGAM, despite the difficult working conditions, to monitor the World Heritage properties and cultural heritage in general, assess damages, undertake emergency conservation and risk mitigation actions whenever possible, and inventory built and movable heritage. The report also stressed the DGAM efforts in maintaining salaries for its staff in the inaccessible Ancient Villages of Northern Syria, and highlighted the positive role played by local communities in some cases to safeguard heritage and limit illegal excavations. No information is given for the sites of ‘Arwad Island’, ‘Noreas of Hama’, ‘Tartus: the Crusaders Citadel-City’ and ‘Ugrarit (Tell Shamra). The emergency consolidation of the stair-step bridge leading to the main gate of the Aleppo Citadel; debris management and damage assessment for 170 historic buildings in the property, by the DGAM. In the framework of the Flemish Funds-in-Trust project entitled ‘Implementation of the Committee Decisions for the Site of Palmyra’ (USD 100 000), an international expert mission to the site is foreseen to support the DGAM in planning emergency consolidation works in Palmyra, but could not be undertaken yet, due to the security situation on the ground. The joint World Heritage Centre/ICCROM/ICOMOS Reactive Monitoring mission, which was foreseen to be carried out to Damascus and Aleppo in March 2017, could not take place under the United Nations security and safety rules. The UNESCO Culture and Education national officers in Aleppo continue to ensure coordination with local and national authorities for the implementation of activities for the recovery of the property. Capacity building for six Syrian professionals has taken place through their participation in a number of ICCROM activities such as the short course series organized by the ICCROM-Sharjah Office on the conservation and documentation of built cultural heritage, and also ICCROM's International Course on Stone Conservation. In addition, active participation of senior officials took place in the Arab Cultural Heritage Forum as well as the colloquia organized by ICCROM on post-conflict reconstruction at Louvre-Lens and in Rome. ICOMOS has closely followed the situation in Syria, maintaining contact with the cultural heritage community in the country, and working to provide advice and raise awareness. Through its Project Anqa, run in cooperation with Cyark, and funded by the Arcadia Foundation, ICOMOS contributed to the 3D recording of six at-risk heritage sites in Syria and capacity building of Syrian professionals – with the aim of fostering the creation of a sustainable 3D architectural inventory. It is also a partner in the AMAL in Heritage project (mobile and web application for rapid damage assessment of cultural heritage in conflict zones) launched by the Global Heritage Fund (GHF) in partnership with ICCROM, the Arab Regional Centre for World Heritage (ARC-WH), and the Prince Claus Fund, which has also provided training to Syrian professionals. The armed conflict situation in Syria and its continued escalation has affected the six World Heritage properties and has substantially limited capacities to adequately sustain and protect their Outstanding Universal Value. The properties have been increasingly threatened by ascertained and potential dangers, in particular the Ancient City of Aleppo, which has been extensively and increasingly destroyed, and which runs the risk of further irreversible destructions during the challenging recovery phase. The illegal excavations across archaeological sites and tells in Syria are a major source for the illicit trafficking of cultural objects and are causing extensive and irreversible damages to those sites, many of which are on Syria’s Tentative List, as well as providing looted artifacts for sale in regional and international black markets. It is recommended that the Committee commend the DGAM, heritage professionals in Syria and local communities who have made sustained efforts to protect cultural heritage and to monitor it closely. The World Heritage Centre and the Advisory Bodies will continue to support the State Party in the identification of the necessary corrective measures and in the development of a Desired state of conservation for the removal of the property from the List of World Heritage in Danger (DSOCR), for all six properties, as soon as the situation allows. It is important that humanitarian and security actions be done in coordination with cultural heritage stakeholders, to avoid further irreversible damages to the properties, and allow for undertaking first aid measures for its cultural heritage. Furthermore, it is recommended that systematic documentation of all damage incurred at the World Heritage properties be duly pursued, whenever the situation allows, and that the Committee reiterate its call to the State Party to safeguard damaged properties through minimal first aid interventions to prevent theft, further collapse and natural degradation, and refrain from undertaking other measures until the situation allows for the development of a comprehensive strategy and action plan that respond to international standards and high-quality scientific methods. With regard to post-conflict interventions, it is recommended that the Committee call on the State Party to plan the future of the World Heritage properties according to international conservation charters and standards, in full consultation with the World Heritage Centre and the Advisory Bodies. It is recommended that the Committee call for international and national heritage professionals to continue to unite for the safeguarding of Syria’s cultural heritage; and to further support its safeguarding through earmarked funds and to contributions to the UNESCO Heritage Emergency Fund. Until conditions improve, it is also recommended that the Committee urge all parties associated with the conflict in Syria to refrain from any action that can further damage the heritage of the country, in particular World Heritage properties and all sites included on the Tentative List, and to fulfil their obligations under international law, and in particular the United Nations Security Council Resolution 2347 of March 2017, in part by taking all possible measures to protect such heritage including the evacuation of World Heritage properties used for military purposes, and the halting of all damages that result from targeting World Heritage properties. It is also recommended that the Committee reiterate its suggestion that the State Party consider ratifying the Second Protocol (1999) of the 1954 Hague Convention for the Protection of Cultural Heritage during times of Armed Conflict. It is further recommended that the Committee also call upon all parties associated with the conflict in Syria and the international community, in particular the neighboring countries to Syria, to ensure effective measures for the fight against illicit trafficking of cultural objects, in line with the UN Security Council Resolution 2199. Note: the following reports on the World Heritage properties of the Syrian Arab Republic need to be read in conjunction with Item 36. 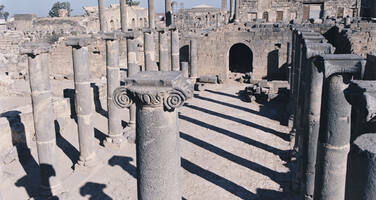 Decides to retain the Ancient City of Bosra (Syrian Arab Republic) on the List of World Heritage in Danger. Also requests the State Party to submit to the World Heritage Centre, by 1 February 2019, an updated report on the state of conservation of the properties and the implementation of the above, for examination by the World Heritage Committee at its 43rd session in 2019.